He wants to lead this country, yet can’t be bothered to wear a small symbol such as a flag lapel pin. 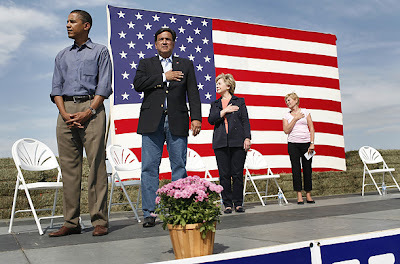 He wants us to believe he isn’t ideologically muslim, yet shows no respect for the country’s flag. DAMN RIGHT I QUESTION HIS PATRIOTISM–HE HAS NONE AND ISN’T FIT TO BE CIC.